Toyota is calling on the talents of Chaka Kahn, the Queen of Funk, for the music in one spot in the new Corolla campaign, launching today. The all-new The 2020 Toyota Corolla “Greater Than” campaign features “Rainy Day,” a spot in which Kahn gives her interpretation of the iconic “I Put a Spell On You,” a 1956 song written and composed by Jalacy "Screamin' Jay" Hawkins. Toyota shot ‘"behind the scenes" footage with Khan. The all-new 2020 Toyota Corolla features a bumper-to-bumper, wheels-to-roof transformation. 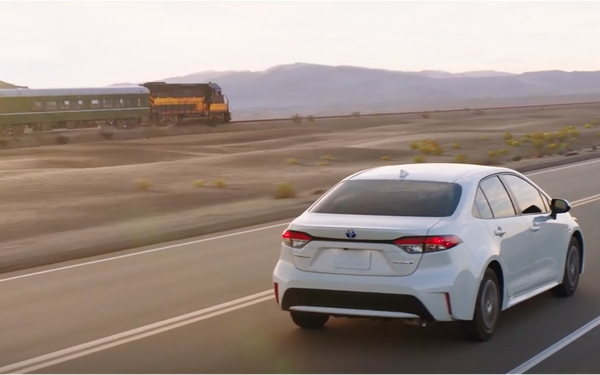 With more than 46 million Toyota Corollas sold globally, the campaign invites drivers to embrace the world and live the life they want, says Ed Laukes, group vice president, Toyota Division Marketing, Toyota Motor North America. A series of 30-second and 60-second broadcast and digital spots were created using insights aimed at a transcultural mainstream audience. The spots highlight specific vehicle features while inviting drivers to stay inspired by choosing the road less traveled. The campaign includes spots from Saatchi & Saatchi, Burrell Communications, Conill Advertising and Intertrend with Zenith Media responsible for TV and outdoor media buying. In “Rainy Day,” a couple turns the mundane task of getting a car wash into an adventure. “Train” portrays a reunion of a couple who doesn’t like “goodbyes” backed by music from Ricky Nelson, and introduces the U.S. market’s first-ever Corolla Hybrid. Five spots -- “We,” “Sound Off,” “Refuel,” “Battle” and “Rescue” -- capture the spirit of an expressive, but straightforward and determined generation. “Metalhead” and “All Natural” feature a parent and an influencer jumping into the unknown, even if it means getting a little uncomfortable, to show support for their family and community. The spots will air across NBC, CBS, FOX, ABC, BET, Telemundo and NBA Draft, and in theaters nationwide in conjunction with National CineMedia. Interactive video units will appear on Hulu, Freeform and YuMe. There will be integrated media partnerships with Billboard Latin Music Awards, Hola Mexico Film Festival, MTV Video Music Awards, ComplexCon, ComicCon, KCON and Gaana Music Festival. Print media includes Conde Nast properties and People en Español. Toyota crafted market-specific “Greater Than” messaging for OOH such as: "Highways > Subways" (NYC) and "Adrenaline > Caffeine" (Seattle). A time-specific digital OOH billboard placed in 10 key markets features different messages across six dayparts, such as "Restless > Rested" (4-7 a.m.) and "Early Bird > Night Owl (7-10 a.m.).